The role of RIC transplantation for patients with acute leukemia (AL), myelodysplastic syndromes (MDS) and lymphoma was addressed in the satellite symposium held in February 2013 at the Tandem BMT meeting in Salt Lake City, Utah. Dr. Forman focused on patients with AL and MDS. He reviewed studies suggesting that RIC can be as effective as MAC in patients in certain subgroups, particularly older adults with AL and MDS. Importantly, RIC was shown to be a reasonable alternative to MAC even in patients with poor risk myeloid malignances and in patients with Philadelphia chromosome-negative acute lymphoblastic leukemia (ALL), in whom MAC historically considered the standard of care. However, across all studies, the relapse rate following RIC transplant remains unacceptably high, particularly in patients with poorly controlled or advanced disease. Dr. Forman reviewed multiple attempts that are being evaluated to enhance the anti-leukemic potential of RIC without increasing its toxicity. Integration of targeted radiation (radioimmunoconjugates and intensity modulated radiation therapy) or clofarabine can augment the anti-leukemic activity of RIC. The relapse rate after RIC transplant can be further reduced by post-transplant maintenance therapy with hypomethylating agents (in patients with myeloid malignances) or tyrosine kinase inhibitors (in patients with Philadelphia chromosome-positive ALL). Adoptive T-cell immunotherapies with chimeric antigen receptor transduced T cells or bispecific T-cell engaging antibodies also have shown promising activity in decreasing the relapse rate following RIC transplants. Dr. Champlin focused on RIC transplants in lymphoma. RIC transplants are widely used in lymphoid malignances and often considered preferable to MAC regimens, particularly for patients with indolent lymphomas or relapsing after an autologous transplant. However, in the presence of chemoresistant or bulky disease the relapse rate following RIC continues to be high. Addition of rituximab or radioimmunotherapy to the RIC can improve post-transplant outcomes by minimizing risk of relapse via variety of mechanisms, including direct anti-tumor activity or enhancement of the graft versus leukemia effect. RIC transplantation makes many elderly and less fit patents eligible for this potentially curative procedure. 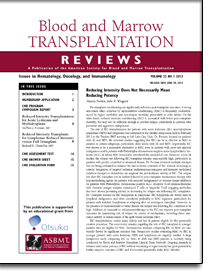 The controversy remains regarding the role of RIC transplant in younger patients who are eligible for MAC. Retrospective analyses comparing RIC vs. MAC are universally flawed by significant selection bias. Prospective studies evaluating MAC vs. RIC in younger patients with acute leukemia, MDS and lymphoma are urgently needed. A large prospective study comparing RIC vs. MAC in AML and MDS patients is currently being conducted by Blood and Marrow Transplant Clinical Trials Network. Ongoing research to enhance anti-tumor potency of RIC without worsening of organ toxicity has great potential to further improve outcomes of RIC and if successful potentially make MAC obsolete.